‘Tis the season to be Adventy! On Sunday we celebrated the beginning of Advent, the four weeks before Christmas where we get ourselves ready to welcome Jesus again, as ‘God became flesh and blood and moved into the neighbourhood’ (John 1:14, the Message). On Saturday James, Carol, Matt and I spent a day at Northpoint training to use the Prepare-Enrich marriage material, to prepare a couple for marriage or to offer a couple marriage enrichment (speak to one of us if you’re interested in this). It was a hugely entertaining and helpful day with Brian Krum from Carey Baptist College, and people from Northpoint and the Cathedral training too. Doing this kind of couple conversation (best done before engagement, I reckon) is a great way to prepare for your marriage, not just your wedding, and Christmas and Advent are a bit the same. Among all the Christmas present-shopping, menu-planning, tree-trimming, family-choreography and end-of-year parties, Advent helps us get excited about the amazing news of God choosing to be one of us, and take on all the highs and lows of human existence. 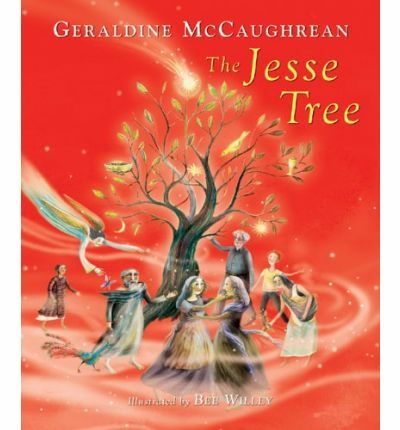 The Jesse Tree books tell stories about Jesus’ ancestors in the Old Testament, one per night, to lead up to Jesus on Christmas Day. I have one available to lend if you’d like to check it out to use with your kids or grandkids. This year we have Advent in Art cards available for everyone to take home, thanks to Mark Pierson at World Vision. Our Advent Women series will follow the paintings on the cards, and there’s devotional material on the back to take you through what happened before and around Jesus’ birth. You can get sneaky secret insight into the symbolism of the paintings here if you’d like some background. 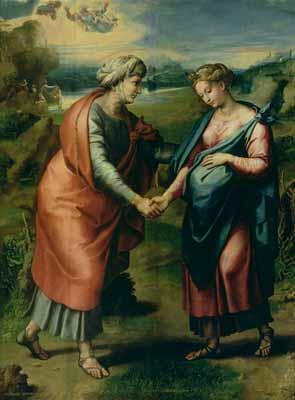 If modern art doesn’t appeal to you, have a look at the Raphael painting the artist, Jan Hynes, is referencing (also above). If you like playing on the internet, there’s lots of Advent stuff around, including this site. Each Sunday we will light a new Advent Candle and put up banners and signs in matching colours, one step closer to Christmas each week. Each Sunday we wear a different symbolic colour to church. This week it’s blue for peace (see the full list here). On Christmas Day, as well as our normal church collection, we’ll be taking up offerings for tranzsend’s Christmas Angel Appeal, this year going to our friends’ work in South Asia, offering employment with dignity to women who have been forced into prostitution. On Sunday you can collect an envelope and information about some Kiwi women who have been involved over the 125 years of Kiwi Baptist involvement in that part of the world. We’d love to hear what you think about Advent. Comment away!